An so we come to the howitzers. 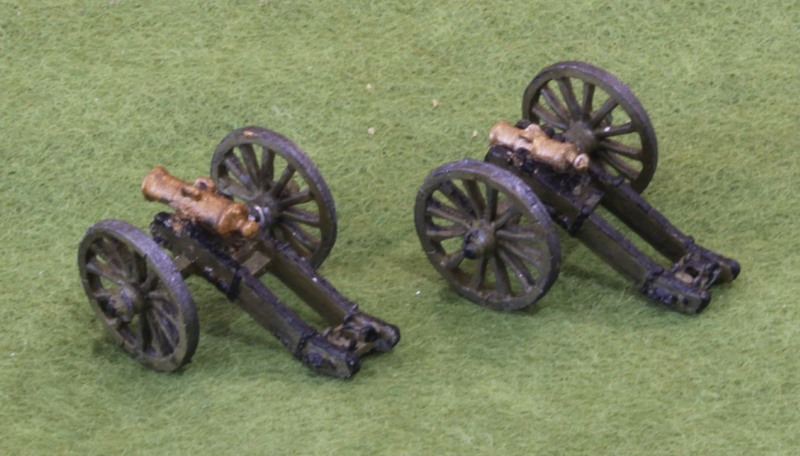 Howitzers are often ignored by wargamers, as they usually only comprised one section of two in each battery – so there is only a call for them if you are representing pairs of guns. My games are grand tactical where each tabletop piece represents one or two complete batteries. And yet I have always had a soft spot for the type, and found ways of including one or two on the tabletop. And when it came to this project the howitzers caused me more research problems than any other aspect – and so has the modelling. Confusion reigns from start to finish. Let’s begin by considering the diagram to the right, which shows a drawing of each of the three howitzer types that the French used in the field, alongside captured weapons. Each of them is usually referred to as a 6 inch howitzer. In addition to these three RC in his Osprey offers some pictures of an earlier “Gribeauval” howitzer that was not in use in our era, so far as I know. The one at the top is the “real” 6 pouce ( = thumb = inch) howitzer, that was cast in the 1790s, and dominates all illustrations of French howitzers. Its calibre is exactly six French inches, which were slightly longer than the ones in modern use in Britain and the US. I will call this the 6 pouce. The second is the heavy howitzer, based on the Prussian 10pdr howitzer. It was never produced in large numbers but it accompanied French 12pdr batteries right up to Waterloo. I will call this the 10pdr. These two I will deal with in this post. The third is the An XI howitzer, more properly called the 24pdr, or sometimes the 5 pouce 6 or 7 lignes (12 lignes = 1 pouce). It is nearly six English (and modern) inches in calibre, and is thus it is usually called a 6in howitzer by British observers. Perhaps disliking the alternative nomenclature, the French also seemed to have used this name very often too. It is much the most important of the three militarily, and also the most challenging to model, so it gets a post all to itself. I will call it the 24pdr. Incidentally DDS uses modern inches to distinguish the three (6.4, 6.8 and 5.9 respectively), but I don’t think this helps – if you must impose modern nomenclature, then surely the metric system is preferable and transparent. So first to the 6 pouce. This is the 8pdr of the howitzers. From the literature and illustrations you might think it was the only howitzer the French had in service. And yet it was not all that widely used – though it is hard to tell for sure because when orders of battle refer to 6in or 6p howitzers they may be referring to any of the three designs, and possibly some captured 7pdr howitzers too. A number of barrels pop up in illustrations; all were cast in the 1790s, and I don’t think any were cast later. RC says that more were cast between 1804 and 1813, but I am sure he is confusing it with the 10pdr. The 6in howitzers captured at Waterloo and in the Royal Armouries, when not referring to the 24pdrs, refer to two 10pdrs, one cast in 1795 and the other 1813 (the entry for the latter was shown in my previous post). The 6 pouce was regarded as inaccurate and its carriage had a tendency to shatter (according to RC). Still, a number were used well into the Imperial era. There is an example in Les Invalides mounted on an An XI carriage, clearly from later on. And the official documentation seems to keep mentioning it. Whether it was used in Spain, like the Gribeauval guns, I cannot tell. All the howitzers described in both French (as published by Nafziger) and English (the report of artillery captured at Vitoria) sources refer to all the field howitzers as 6in. The surviving example from Vitoria in Lisbon is a beautiful 24pdr, showing that the French, as well as the British, referred to the 24pdr as “6 inch”. The Spanish government may not have used this design, unlike the Gribeauval guns – and these were the main source of artillery for the French in Spain, apparently. This is the source of a nice picture in RC – though this elevating mechanism (quite unlike the Gribeauval one) was replaced in 1792 according to DDS (the elevating screw came from below the barrel). Artists and historians seem attracted to these drawings and have quickly appropriated them to represent all French howitzers. It is used, for example in Mark Adkins’s book on Waterloo, in spite of the fact that it was almost certainly not used in the 1815 campaign. The visual appearance is certainly striking. You can see from the above drawing that the barrel is very stubby; there is not much barrel in front of the trunnions and it barely projects from the carriage. But it is also very chunky. as is the carriage, which, apart from the elevating mechanism, seems to have a family resemblance to Gribeauval pattern (though the cheeks do look a bit chunkier, they have that characteristic bend) The wheels are the same as the 8pdr and 12pdr, but the trails are shorter, though longer than for the 4pdr. One remarkable picture in DDS shows this carriage mounting a 24pdr from about 1822 – including the triangle of bolts relating to the obsolete elevating mechanism. This may be an attempt to render an 8pdr carriage, which we are told was in use at the time, but it clearly refers to the obsolete 6 pouce carriage. There is a bit of problem with the drawings though. The barrel seems to be subject to different drawings from the carriage, and the scales get wonky. According to the above drawing the length of the trail is 187cm; according to the picture in DDS it 298cm. According to a table of dimensions in RC (which looks authoritative, though the metric conversion can be shaky) it is 268cm – which is the version I take as accurate. The DDS scale appears to be accurate for the barrel, but not the carriage. The colour illustration in RC seems to have overcome these problems, though, to produce a very nice picture, albeit with the out of date elevating mechanism. How to model the 6 pouce? Unsurprisingly, it is the only French howitzer that any of the manufacturers has attempted. But they haven’t given it much attention. Battle Honours gave us a barrel, but supplied it with their “light” gun carriage, which I have used for the 4pdr. Old Glory and Fantassin/Warmodelling give us a tiny barrel to plant on a standard 8pdr carriage. Minifigs produce quite a nice model, but under scale for my purposes. AB get the closest. The overall dimensions and topography are correct on my models, bought over 10 years ago, and it even gets the elevating mechanism right, but apart from the wheels it just looks a bit weedy. The barrel, in particular, is much too thin – it should rival the 12pdr in girth (the calibre is larger after all (166mm to 121mm). The model may have changed, though. The picture in the link on the Fighting 15s site seems to show an 8pdr style carriage, not unlike the one used for the 6pdr. The recent Blue Moon offering is nothing less than a disaster. The carriage is hopelessly over scale (33mm long, or 330cm in scale). The barrel is on a more accurate scale, but lacks heft, though it is better than the AB attempt. The wheels are fine though! So what to do? I used the BM barrel on the AB carriage. I already had three of the ABs, and I used two for this purpose. Some of the BM carriages I converted to 12pdrs, and I have used all the wheels – so I have managed to get something form £12 purchase of six. If you are starting from scratch I can only suggest you use the AB version and grit your teeth – unless you fancy scratch building the barrel yourself – it has quite a simple shape after all. I remain a bit disappointed with the carriage though. And if they have changed it to the 8pdr type, then this is something of a blank. The closest I can get is the Minifigs Prussian 10pdr, but the wheels are too small, the carriage a bit too broad, and the barrel nothing like right. It may be easier to model it on the AnXI carriage – see my next article. The barrel will still be an issue! And now for the 10pdr. 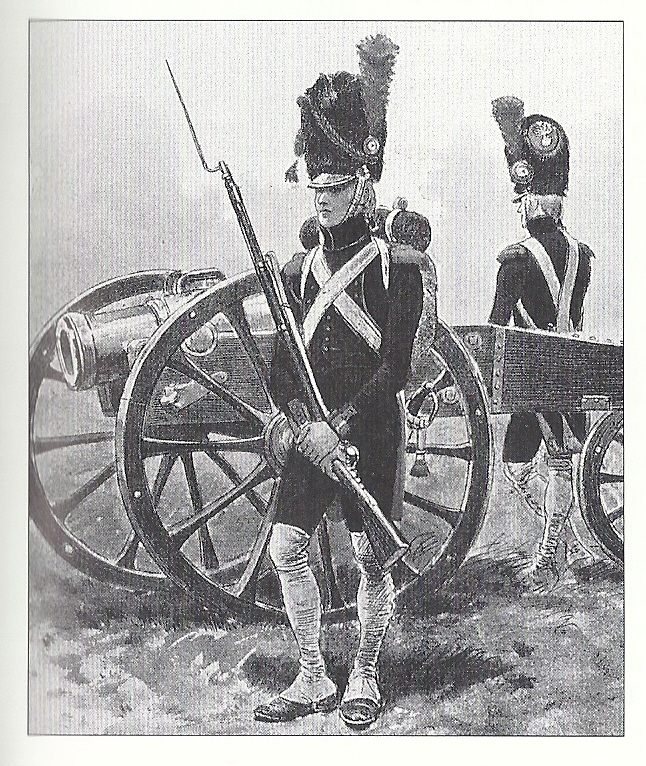 During the 1790s, apparently, the French were impressed with the Prussian 10pdr howitzer. So much so they produced a copy for their own use in 1795. I’m not entirely clear why. Perhaps problems with the 6 pouce howitzer led them to look on foreign weapons more kindly. But its more obvious competitor was the 7pdr howitzer, and Austrian 7pdr howitzer was certainly well regarded. DDS mentions the use of captured Prussian and Austrian ammunition. Perhaps the French just wanted something hefty to join their 12pdr batteries. And this piece was hefty at some 670/680Kg. That was twice as heavy as the 6 pouce, and heavier than the 8pdr gun – and only 100Kg lighter than the 12pdr. And it wasn’t a particularly new design – the original dated from 1743 according to DDS, and I have seen a picture of the barrel of the Prussian version complete with antique dolphins, representing mythical sea creatures, not the simple handles of the Napoleonic era. Still, it continued in use throughout the era, with additional pieces cast in 1813. Two were taken away by the British at Waterloo and are now in the Royal Armouries, one dated 1795, the other 1813. What of its carriage? Here I have practically nothing to go on. 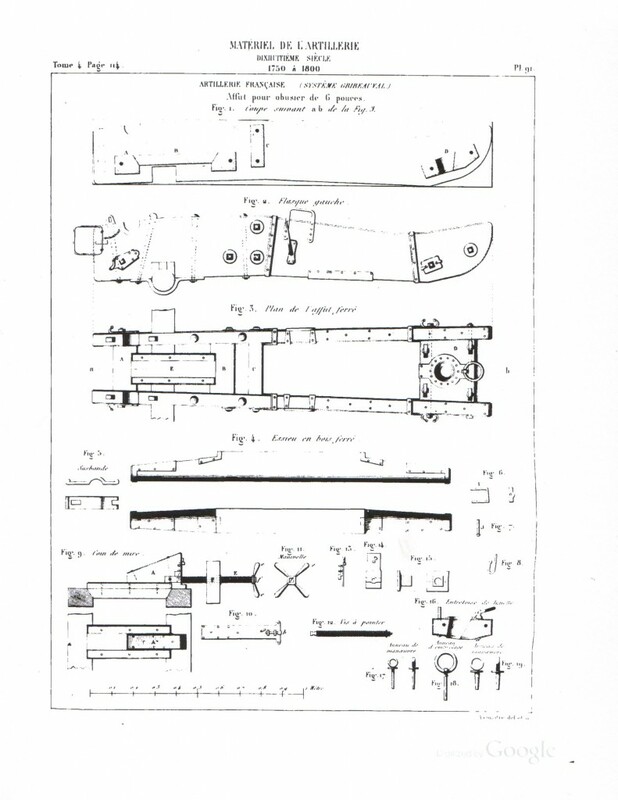 DDS declares that the commonly depicted 6 pouce carriage was the Prussian original for this (in the caption to the drawing of the 6 pouce carriage, which shows a very clear drawing of the 6 pouce barrel alongside). I don’t believe this – the design is surely more modern and takes features from the Gribeauval design. But in the absence of any better data, I have decided that ithis carriage was used for both designs. The trail would no doubt have to be widened a bit to take a significantly broader barrel, but I expect that was standard stuff in those days before precision manufacturing. My basis for this (apart from assuming that there might be something in the DDS reference) is a picture in RC showing a Guard artilleryman in front of a howitzer (see below); this is clearly the 6 pouce carraige, but the barrel is a bit ambiguous (a bit too long-nosed for the 6 pouce, without looking like a 10pdr). This picture seems to date from late 19th Century, and is thin evidence indeed. But if in doubt I often take a lead from artists confronted by the same problem; the 10pdr was surely the howitzer used by the Guard foot batteries. Whether this carriage was really robust enough for this brute is another question. Later in the era tangential references in DDS suggest that it may have been mounted on on a modified An XI carriage with an elevating plate. But there are no illustrations of this piece, apart from the barrel, that I have seen anywhere, so this amounts to guesswork. One thing can be said about its appearance though, apart from being very bulky: the trunnions are towards the bottom of the barrel (like many pieces of heavy artillery). This means that it would look as if the barrel was perched on top of the carriage, compared to how other weapons look. Modelling this piece, almost invisible to history, might seem a hopeless task. But not so. 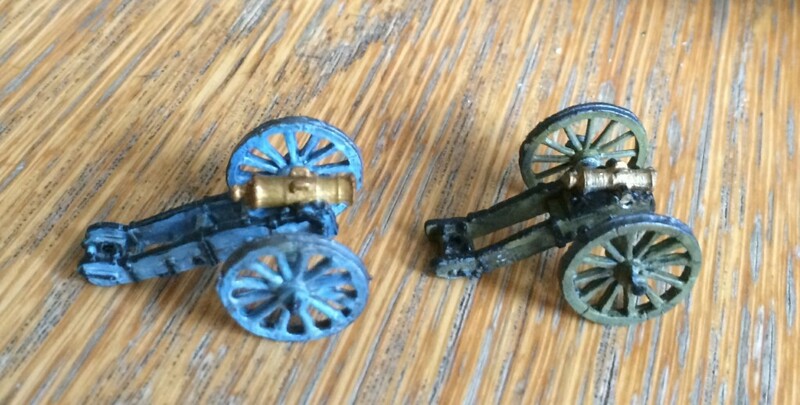 I had bought the AB Prussian 7 pdr howitzer to support my slowly developing 1815 Prussian army – but it looked wrong. The barrel looked far to big, and it perched on top of the carriage. As I became aware of the 10pdr, the penny finally dropped. This represented a 10pdr howitzer, not the 7pdr! 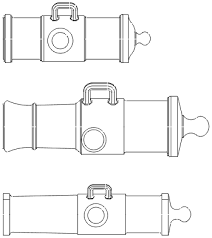 The dimensions measured up too – though since my French artillery barrels have a slight tendency to be oversized, it might not look quite right in comparison – though fine next to the 6 pouce, as it happens. I used this barrel on the AB French howitzer carriage. I had to add trunnions to it (the AB model moulds these to the carriage not the barrel) from a plastic rod – quite hard for my clumsy fingers, though. I simply borrowed a barrel from one of my many old Battle Honours Austrian howitzers to put on the original Prussian carriage, to give quite decent looking 7pdr. If you don’t want to do this, simply convert the Prussian carriage to a French one. In essence the Prussians copied of the French An XI carriage design for their later ordnance, so it makes quite a plausible carriage for French service. Just cut out the retaining bars for the ammunition box underneath rear end of the trail, and add some trail handles if you feel up to it (bend and cut some fuse wire or ordinary stationery staples and glue on). If you have the patience (I did not on my Prussian conversions) you can also cut off/file down the rings on the right of the rear transom. And here is the 6 pouce next to the original AB Prussian “7pdr”. The Prussian howitzer wheels are too flat – a common problem with AB models – but these can be bent into shape with pliers. Apart from the flat wheels, and mounting the wrong sized barrel, the AB model is a beauty, incidentally. Note that the AB French model doesn’t have the distinctive trail handles, which it really should. I haven’t had the patience to add them in this case!